I work from my home based studio in Edinburgh. Since setting up my practice in 1991 I have made tapestries for private and public commissions and I have regularly exhibited in the UK as well as Europe, Japan and Australia. My work is held in public collections that include the V&A Museum, London, Arts Council England and Elegan Kobe, Japan. My tapestries are about the emotional impact of colour, creating an immediate sense of energy through a vivid but limited colour palate. I am fascinated by the intimacy of weaving and storytelling, bringing together the past and present to create something new and still unfolding. 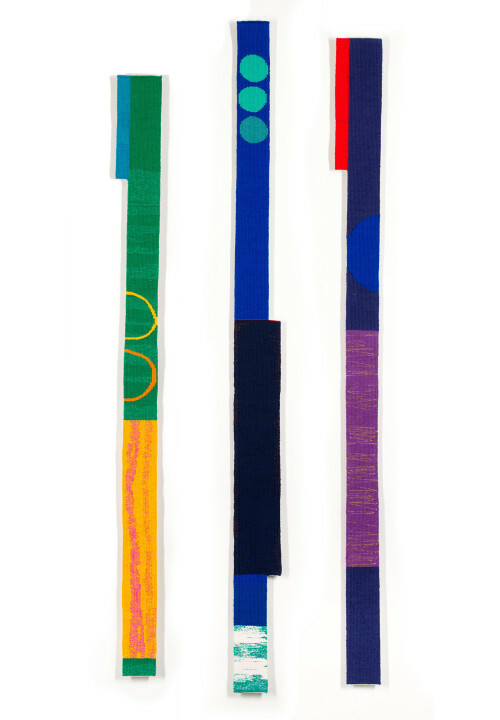 Highly narrative, my work references people, music words and events that are woven into the fabric. The imagery is a careful balance of patterns, symbols and mark making. visual effect. I like to see my work as something constantly evolving into new areas. 2016 'Here and Now'. International Tapestry. NCCD. 2015 'New Year Showcase'. Contemporary Applied Arts. London. 2013 'Small Talk'. The 62 Group. Goldsmiths University. London. 2012 'Ori-Rhythm II'. Kyoto Art Center. Kyoto. Japan. '62@50'. The 62 Group. Holden Gallery. Manchester. 2011 COLLECT. Saatchi Gallery, London.Flow Gallery. 'Bending More Lines'. The 62 Group. Rijswijk Museum. Holland. 2009 '10N/10S' La Cite du Design. St. Etienne. France. 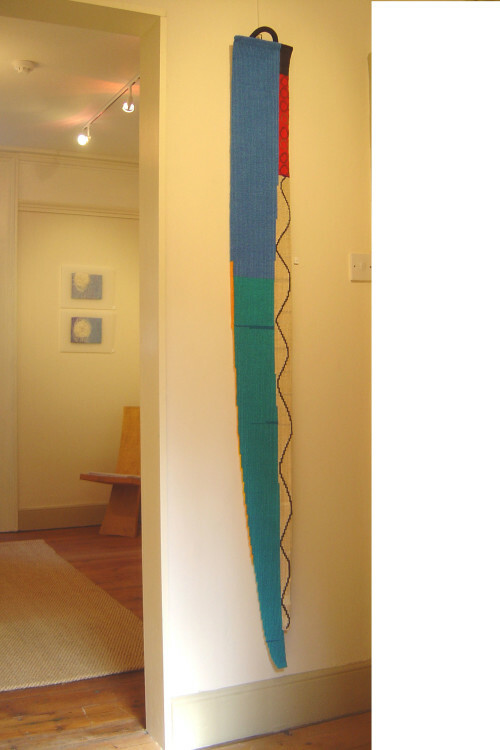 2008 'The Fine Art of Tapestry Weaving'. ANU Canberra. 'Tapestry 08'. Bankfield Museum. Halifax. 'Spectrum'. Contemporary Applied Arts Gallery. London. 2007 COLLECT. International Art at the V&A. London. Penelope’s Thread. 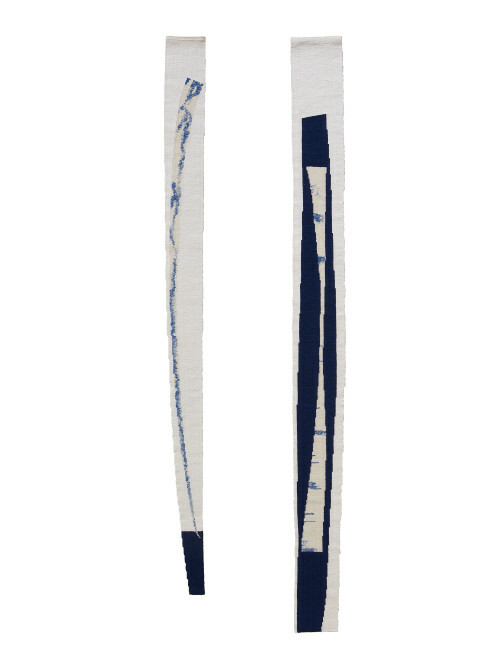 Contemporary Tapestry. V&A. London. 2005 'Meet the British Crafts'. Ozone Design Centre. Tokyo. 'The Art of Craft'. Medici Gallery. London. 2004 'Dialogues'. Joint exhibition. Red Box. Newcastle. 2003 'Focus'. Contemporary Applied Arts Gallery. London. 2002 'Textiles in Context'. The 62 Group. V&A. London. 'Anthropomorphic Relationships'. Flow Gallery. London. 2012	Arts Council Travel Award. Japan. 2008	Arts Council/Prospect Travel Award. Australia. 2005	Arts Council Research Award. Japan. Arts Council England. North East. 2014	St. Laurence Church, Cambridge. 2009	West Jesmond Primary School. Newcastle. 2007	Flagg Court Health Care Centre. South Shields. 2002	James Cook University Hospital. Middlesbrough.